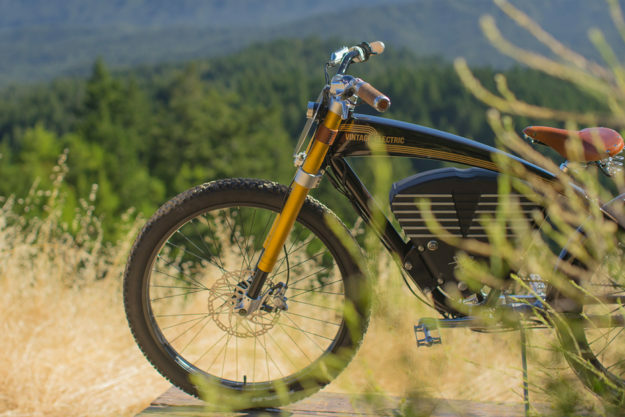 Four years ago, designer Andrew Davidge started building electric bikes in his parents’ garage in California, helped by a couple of friends. Today, he runs a Silicon Valley company with 15 employees, a permanent factory in Santa Clara, and a global dealer network stretching from England to New Zealand. 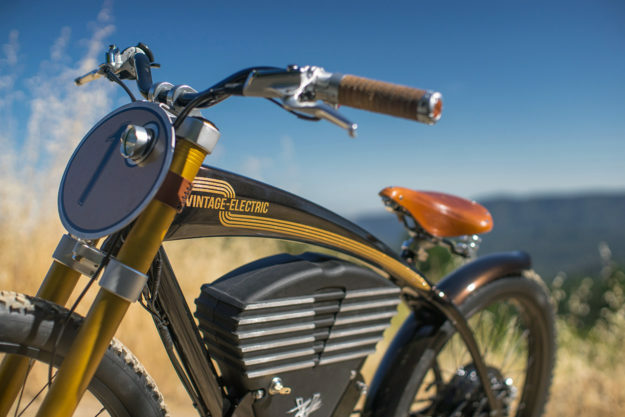 Let’s get one thing straight, right away: the Vintage Electric Scrambler is not designed to replace your Harley-Davidson Road King. It’s designed for short commutes, scooting over to a friend’s house on a sunny evening, or zooming down a twisty fire road. 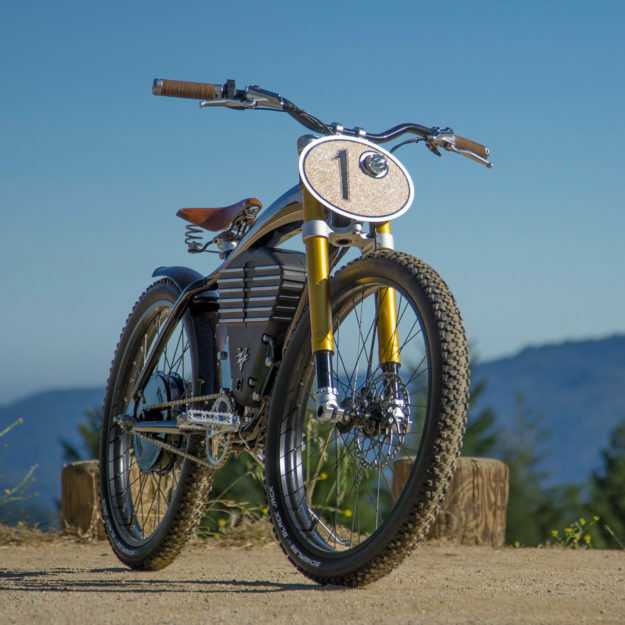 The heart of the bike is a 702 watt-hour lithium battery, housed in a tough casing sand cast just up the road in San Jose, CA. It takes around two hours to recharge, at an estimated cost of 18 cents. Boosted by a regenerative braking system, you get a range of 35 miles (56 kilometers) in the regular ‘Street Mode,’ which has a top speed of 20 miles an hour (32 kph). 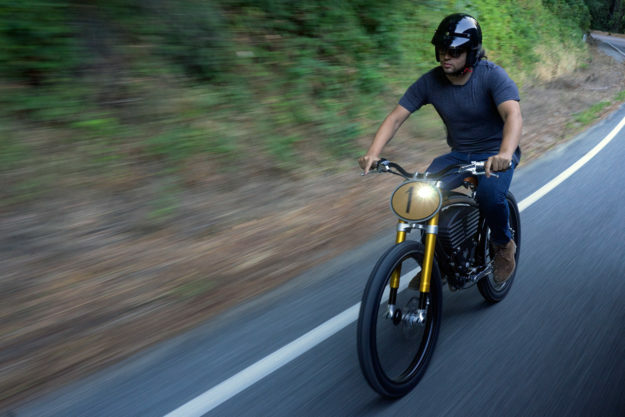 That might seem slow—heck, it is slow—but it means that the Scrambler can be ridden on public roads in the USA and EU without a license. At the flick of a switch, you can enter ‘Race Mode,’ which engages a 3,000 watt rear hub motor and takes you up to 40 mph. But that’s only for when you’re on private property. The specs are good: a lightweight hydro formed aluminum frame, custom-specc’d forks from the Colorado suspension specialist MRP, Shimano Alfine hydraulic disc brakes, and Kevlar-reinforced Schwalbe Black Jack tires. The 26-inch wheels are made in-house using Phil Wood front hubs, and the grips and saddle are finished with leather from Brooks England, est. 1866. The ‘paint’ is a lustrous metallic root beer powder coat, with gold flake graphics. The price is $6,995, a smidgeon more than the base model Harley Street 500, and twice as much as a Honda Grom. That’s the economics of the embryonic electric market for you—plus the high number of components made in the USA rather than India or Thailand. It’s also cheaper than several models of MTB made by companies such as Giant and Trek. You’re also paying for quality design and build. 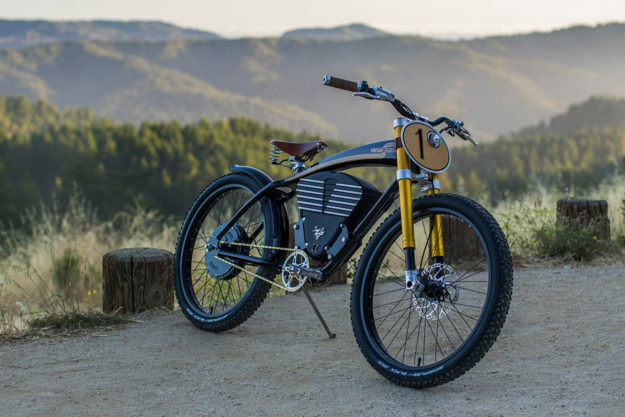 Proof of that is Vintage Electric Bikes’ hookup two years ago with the cult utility vehicle builder Icon 4×4, for the limited edition E-Flyer. 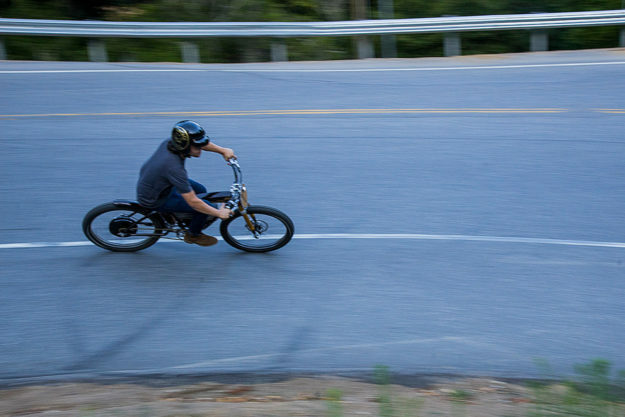 We reckon the VEB Scrambler is the perfect second ride for someone who already has a big road bike in the garage, but also likes to explore local trails or run short errands around the neighborhood. And anything that reduces our dependence on fossil fuels has to be a good thing…right?